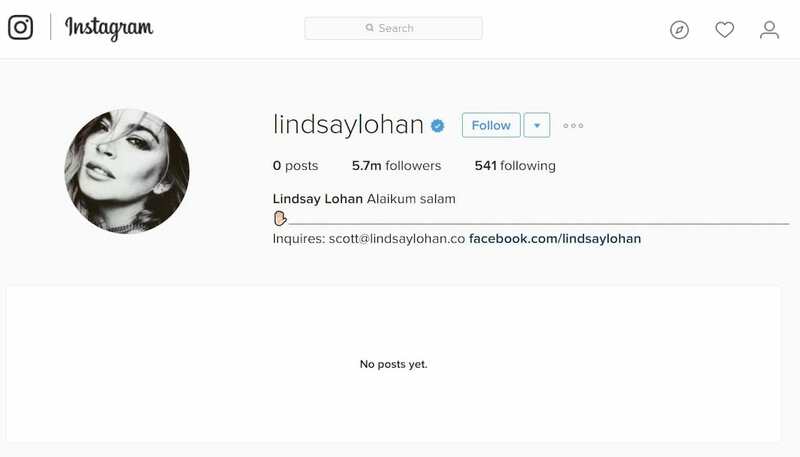 Lindsay Lohan has spurred rumors of a conversion to Islam after deleting every image on her Instagram account and changing her bio on the social media site to an Arabic message. The actress’s social media page – which was once littered with lingerie-clad selfies – is now blank except for the phrase ‘Alaikum Salam,’ an Arabic greeting of goodwill which means ‘and unto you peace’. The change to Lohan’s social media pages and status could just be a reflection of her respect for Dubai, the country the actress has reportedly moved to. But the ‘cleanse’ has led some fans to believe that she has concerted to Islam. Lohan first prompted rumours of Islamic beliefs in 2015, when she was photographed holding a copy of the Koran while doing community work. We all believe in something and at the end of the day it all ties to a god or a spiritual adviser. In October, she visited Syrian refugees in a Turkish government-run Syrian refugee camp in Nizip. The Anadolu Agency, a Turkish news site, said Lohan toured the social facilities and preschool at the camp before giving refugee children gifts. But Dina Lohan, Lindsay’s mum, has confirmed to Gossip Cop that the actress is simply taking a break from social media. We can attempt to explain this every way we want, but LiLo is just gonna keep doing LiLo.